Dave Bidini is hands down the best writer in hockey these days. So news of a new release from Bidini is greeted with eagerness. 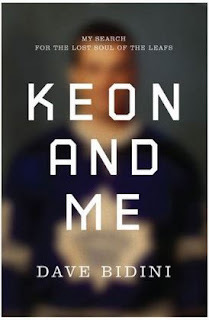 When that book is about Dave Keon and the Toronto Maple Leafs, the anticipation was rightfully through the roof! To no one's surprise, Bidini delivers. Bidini is the most creative hockey writer of our time, and Keon and Me is nothing short of a fantastic piece of literature that even non-hockey readers will thoroughly enjoy. This book is an instant classic that transcends the hockey world. While Keon And Me is a non-fiction book, Bidini presents the protagonists as wonderful characters that are easy to connect with. 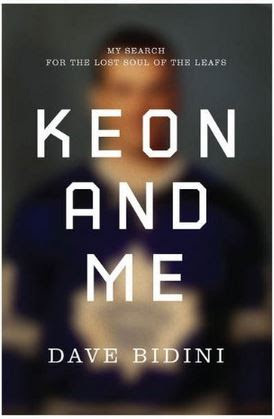 Obviously Toronto Maple Leafs legend Dave Keon is one of the main characters. He's a fascinating case study under any circumstances. After all, he was one of the most beloved players in the history of "Canada's Team" yet he has essentially been estranged from the sport for decades now and no one really understands why. The other main character, as you can guess by the book's title, is Bidini himself. It's actually two different Bidinis - the 11 year old hero worshipping kid who has to deal with Keon's exit, and the current day Bidini still trying figure out not only Keon's cloudy story but his own coming of age. Through it all, Bidini shows an amazing and unconditional devotion to his childhood hero. The book is part memoir and part an ode to Keon. It is also partly an ode to hockey at various stages in our lifetimes, specifically how we cling to that childhood innocence that forever keeps us in love with the game. This book should break down the walls set and win some critically acclaimed non-fiction awards. Yeah, it's very much a hockey book and that's frowned upon by literary elitists, but this book is so much more than a hockey book, too. It is a literary gem that will stand the test of time. Wow. I guess I'm going to have to read this.